I was recently lucky enough to attend an excellent economic summit held in Athens to discuss what can be done about Greece’s endless economic downward spiral. I had gone to the event mainly as an exercise in educating myself, but being a freelance journalist who constantly looks to turn everything into a story (that’s how I make my living after all!) I pitched it to a few places beforehand and the news branch of Vice.com showed an interest. Due to word limit restrictions and a tight deadline, plus changes to match Vice’s style and format, the edited final product of that article appears here. My original version appears below and gives a shout out to the organisers of the event who did a great job. Why is this important? Because in the midst of one of Europe’s worst economic downturns, the people living through it, Greek citizens, rarely if ever get access to this level of debate, and that too for free. There was so much material to work with, it was in the end very hard to choose what to include in the article and what to leave out. I was fortunate to briefly speak to Mr Sargent himself, as well as a few other speakers. Considering the points of view exchanged, I really feel it should have been compulsory attendance for everyone in the Syriza government! Below is my original version which covers in a bit more detail the events of Tuesday’s summit. Nobel Laureate Thomas J. Sargent called Greece’s crisis and others like it the macroeconomics of broken promises at an emergency economic summit held on Tuesday in Athens to discuss how to break Greece’s continuing economic crisis. The government last week made a scheduled EUR 774 million payment to the IMF and is now desperately short of cash. Greece is lobbying to release more funds with little success. Leaked reports that European Commission leader Jean Claude Junker asked to allow Greece some breathing space have been denied by the Commission. Mr Sargent was one of several speakers invited to shed light on Greece’s economic mistakes and possible solutions. Comparing Greece’s current situation to the American Civil War debts, he said was keen to know what Greek Finance Minister Yanis Varoufakis plan B was if the country’s creditors refused to see his point of view. “We have refused to sign on the dotted line because it’s not a solution to throw good borrowed money after bad borrowed money simply to keep pretending that the crisis of insolvency is a crisis of liquidity as we’ve been doing since 2010. Talking about the next steps, Mr Varoufakis said: “We need to see how can we use public assets through privatisation and incorporating public assets with a developmental bank that will create the investment flows and bring in investment from the private sector. “What we are trying to do with these negotiations is to get the other side [the troika] to remove itself from a failed logic which they know has failed but can’t acknowledge for political reasons, while at the same time acknowledge that Greece, if it doesn’t reform itself seriously, is not going to recover, whatever macroeconomic miracles we pull out of a hat.” he concluded. In his closing statements, Mr Sargent commented that he would have liked to have debated some of his points with Mr Varoufakis, who left immediately after his keynote speech in a flurry of media attention. A disgruntled audience member responded saying “That’s his fault,” to applause. The Nobel Laureate told Vice he had accepted the invitation to attend to learn from the panel of guests and because of Greece being a key factor in what happens next with the single currency. “Greece is right at the centre of destiny of the Euro, not whether it survives but what it will look like as it survives.” said Mr Sargent. Greece’s five year economic crash has been contributed to in a large part by government overspending, leading to an overinflated and inefficient public sector, bureaucracy, corruption and cronyism. These were some of the issues addressed at the event was organised by the Atlas Network, the CATO Institute, Liberty Forum of Greece, Germany’s Friedrich Naumann Foundation and the Greek Liberal Monitor. Guest speakers represented a mix of backgrounds from ex finance ministers of European and Latin American countries to a Nobel Laureate and current members of Greece’s parliament. Alexander Skouras, Associate Director of Institute Relations at the Atlas Network told Vice: “There is a need to hear the intellectual, the practical and the political argument for reform and we hope that the Greek public and the Greek political leaders today had a chance to hear that. “This situation [in Greece] has driven away discussion from the real economy which can only improve if we succeed in implementing structural reforms. A common theme among speakers was the urgent need for structural reforms to tackle Greece’s public sector, culture of corruption and to promote privatisation and a free market economy where doing business is easy and transparent, almost none of which Greece’s previous or current governments have addressed. Greece currently ranks as the worst country in Europe in terms of business freedom, coming last in the EU for economic freedom, global competitiveness and transparency of markets. 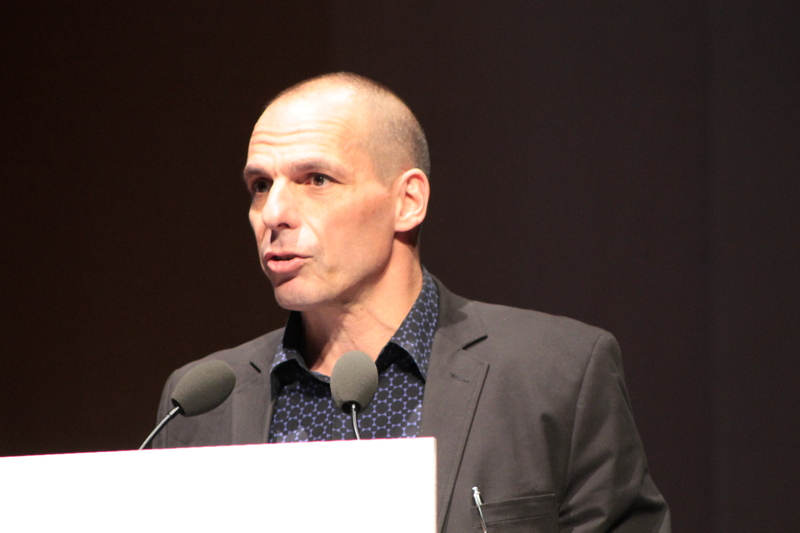 Several of the speakers warned starkly against the much-touted scenario of a Grexit – Greece leaving the single currency – including Professor Nicholas Economides of the Stern School of Business, New York. “Greece has three options: the first is for greece to default and leave the Euro, the second is for Greece to default and remain in the Euro and the third is for Greece to reach an agreement with the EU.” said Professor Economides. Lajos Bokros, former Hungarian minister of Finance pointed to Vladimir Putin’s rise to power as a consequence of Russia’s 1998 default, a government that Syriza is keen to get closer to as other sources of funding close off one by one. “The cost of default is enormous. Default is the most costly scenario, it is austerity with no end.” said Mr Bokros. Former Finance Minister of El Salvador, Juan Jose Daboub, said that while Greece’s crisis appears unique, it is not in the context of Latin American economies where such crises crop up every five years or so. He pointed to Argentina, Mexico and Brazil as repeat offenders. Additionally, he mentioned a lack of strong leadership in Greece in all areas from the state to the church and the army as one of the country’s weaknesses. As the audience, largely made up of members of the public, listened and asked questions, the sense of urgency and frustration at lack of progress by Greece’s current and previous governments was tangible. Audience members were quick to tear down New Democracy’s Kyriakos Mitsotakis’ comments about the cuts his government made to the public sector. A question about the true nature of the public sector reductions which Mr Mitsotakis presented to the forum – the numbers were achieved in part by pushing staff into generous early retirements or into a pool on 75% pay until they were hired elsewhere – was cut off by applause from the audience before it could be finished. Greece’s public sector is protected by its constitution which some say is a barrier to reform. Greece’s next payment of EUR 305 million to the IMF is due on June 5th. Out of cash and with no deal in sight, the government said on Wednesday that the payment would not be possible without a deal with its creditors. Note: See the speeches from the event here. Wow! If that’s a summary of the insight the forum brought to the subject, no wonder Varoufakis left early. Did no one, honestly, have a single insight or prescription for how to reduce debt, alleviate austerity and kick-start the Greek economy? Nothing? Really? You write: “Mr Sargent was one of several speakers invited to shed light on Greece’s economic mistakes and possible solutions.” And yet, forgive me if I missed something, there wasn’t a single solution forwarded in your report. Did they not make any, or were they just of lesser interest to you than reporting the snipe at Varoufakis of a heckler?